Hands On BlackBerry's comeback with a new operating system, BB10, turned into one of the greatest tech flops of all time. Almost one year after the launch, BlackBerry still sells far more of its ancient BB7 devices than it does BB10 devices. But could you turn BlackBerry’s misfortune to your advantage? With a street price of around £140 for a new one, the SIM-free BlackBerry Z10 touchscreen smartphone is now excellent value, and has a lot of appeal for a power user. Other platforms may boast greater simplicity or flexibility, but BB10 is reminiscent of the Palm and Psion in their heyday: rich functionality for professionals. While it was immature and clunky at launch, the rough edges have now been smoothed out. For example, the BlackBerry's built-in feature-rich messaging client and calendar apps can only be rivalled by making a third-party purchase on other platforms, while Microsoft’s Windows Phone still lacks a built-in VPN client. The base of BB10 is QNX, a lauded Unix derivative renowned for its reliability, performance and sophisticated features for developers. Little wonder there's a two-week waiting list for Carphone Warehouse's £149.99 SIM-free deal. However there was a serious obstacle for anyone considering adopting BB10: the absence of quality third-party applications. This is about to change – drastically. The imminent release of BB10 version 10.2.1 – now nearing the end of beta testing – takes Android compatibility to a whole new level. It wasn’t completely glitch-free, but for much of the time BlackBerry 10.2.1 runs Android binaries so well they are typically indistinguishable from native applications. What’s changed? 10.2.1 has the ability to run the native Linux binary extensions on the QNX-based OS thanks to a clever piece of engineering, and there’s now a direct installer app called Snap to take advantage of this by giving you access to the Google Play Store. What follows is a "How To" guide using a beta version of the 10.2.1 OS - and then some performance and compatibility observations from my own experience with the system (use at your own risk). While BB10 may not be a “better Android than Android”, it’s very close. If you can’t wait for the official release, it’s possible to install a leaked OS: a nerve-racking but fairly quick and simple process. Instructions can be found on the BlackBerry fan forums: it requires a Windows PC, the OS image is around 1GB, and the flashing process takes around 10 minutes to complete. Experienced leak users recommend a security wipe before installing the beta image, which can take two to three hours. And don’t expect to be able to restore your settings from a backup: start with a clean slate. Once you have 10.2.1 installed, it’s time to install the Snap app. BlackBerry already has the ability to run Android .apk binaries, but previously this required converting the .apk files to the BB10 .bar executable format and sideloading the converted file via a PC or a browser. Snap, developed by Jim Muir, installs them directly onto the phone from the Google Play Store using a valid Google sign-in you already have. No conversion is required, apps are installed as if the device is an Android phone. You can find Snap here. 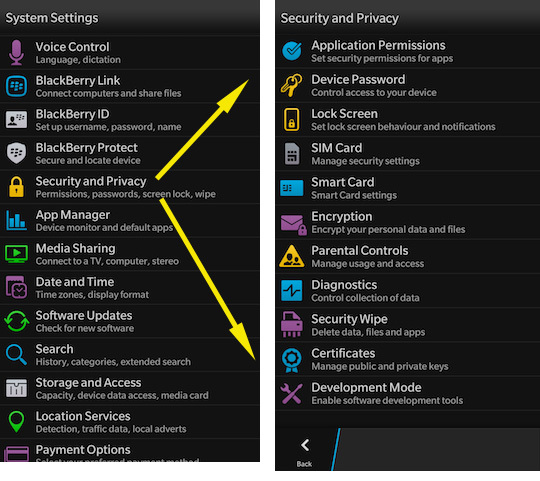 Snap itself is a native BB10 app, but security-conscious BlackBerry doesn’t allow third-party apps to run without changing the settings, by default only apps from BlackBerry World store can run on BB10. So installing Snap requires a one-time sideload. Once you’ve done this, it’s unlikely you’ll need to do sideload anything else ever again. Next, you must get your device ready to receive third-party apps. (This requires jailbreaking on an iPhone, while it’s a simple toggle on stock Android. On BlackBerry, however, it’s somewhere in between these two extremes.) From Settings, choose the Security pane, then change two of the settings, one in Application Permissions and one in Development Mode. 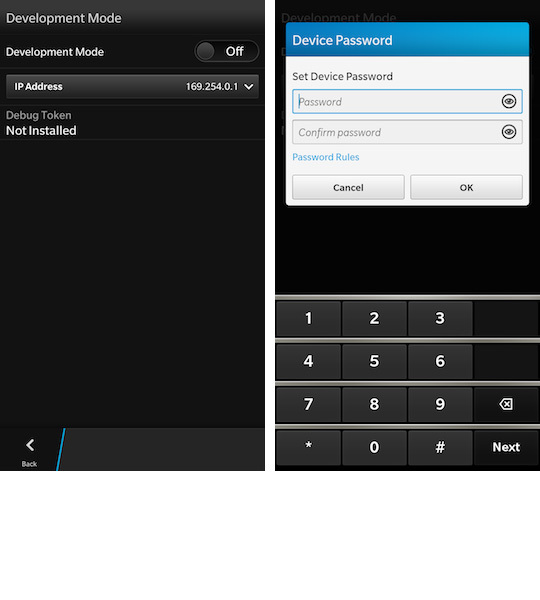 Developer Mode is required to sideload the Snap binary, and is set with a toggle and a numeric password, which expires in 10 days. You can toggle this off again once you’ve downloaded Snap. 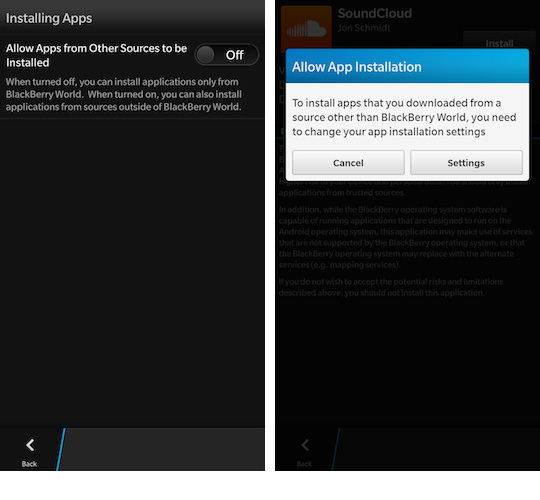 For sideloading there are various methods. 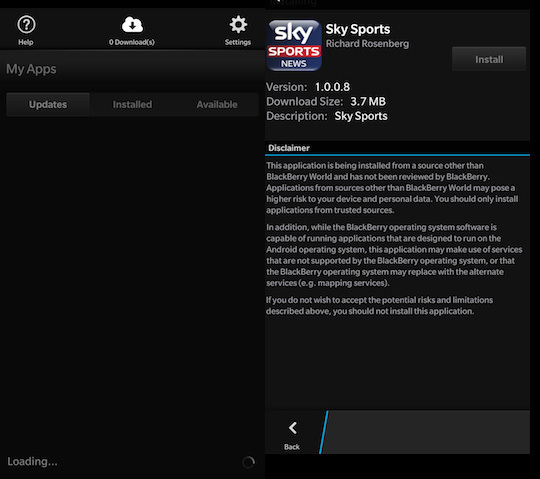 There’s a plug-in for the Chrome browser BB10 / PlayBook App Manager. 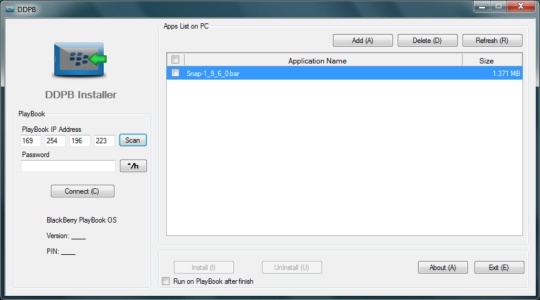 Here we’ll use the DDPB Installer, and it’s much less complicated than it looks. Now connect the BlackBerry to your PC and run DDPB, and scan for the IP address of the phone. Once you’re connected, load the binary .bar of Snap. When you can see it on your phone’s home screens, you can disconnect, put away the PC and turn Developer Mode off. And now you’re in. Start Snap, enter your Google ID and browse the Play Store. Because Snap creates a Google a Google Service Framework (GSF) ID it isn’t spoofing identity. To Google, it’s simply another Android device. Installing Android apps is now a breeze. It’s very much like browsing the Play Store, only there’s an extra click to install. Note the disclaimer. So how does it work in practice? Let's find out. Next page: A better Android than Android?